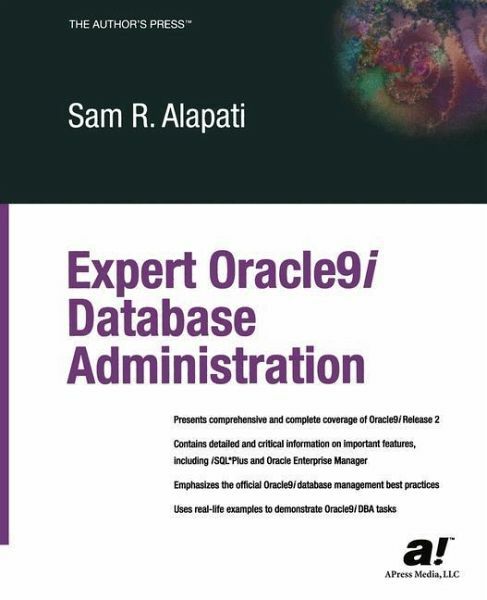 This is the only real Oracle 9i Database Administration book on the market! This 1,000 page book enables a beginner or intermediate level Oracle DBA or Oracle Developer/Manager to master the art of building and managing complex Oracle 9i databases. 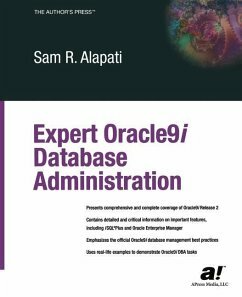 Expert Oracle 9i Database Administration is thorough in covering all aspects of the 9i database and also includes a UNIX primer, as well as an introduction to SQL and PL/SQL. Sam R. Alapati covers the entire spectrum of the new Oracle 9i RDBMS software and clearly explains how to use all of its powerful features. Sam R. Alapati is an experienced Oracle database administrator who holds the Oracle Certified Professional designation and the Hewlett-Packard UNIX System Administrator certification. He currently manages Oracle databases at the Boy Scouts of America's national headquarters in Los Colinas, Texas. Alapati has been dealing with databases for a long time, including the Ingres RDBMS in the mid-1980s. He is also well-versed in the Microsoft SQL Server, Sybase, and IBM DB2 database management systems.